I never considered myself someone who was meant to teach people. Not that I was bad at it, it just wasn’t something that came naturally to me. I certainly never considered becoming a skydiving instructor. I went to college for English and History, and people always asked me if I wanted to be a teacher. It was never even a consideration as far as I was concerned. Sure, I could show someone how to do something; I could explain a skill to a person one on one, like showing my mom how to use the internet or teaching my sister how to fill out a check. Teaching another person how to not die after jumping out of an airplane is not something that was ever on my ‘life direction radar.’ Until I learned how to not die after jumping out of an airplane. Something happens when you find your passion in life. Everything changes. And it continues to change. I suddenly found myself in position where nothing mattered except skydiving. Not even eating. I did whatever I had to do to get on that next load. I renamed my savings account on my internet banking to ‘skydiving.’ I completely dropped the plans I had made to move to New York City. And as I learned how to skydive, I found myself wanting to share that experience with others. Which, in no uncertain terms, meant teaching. 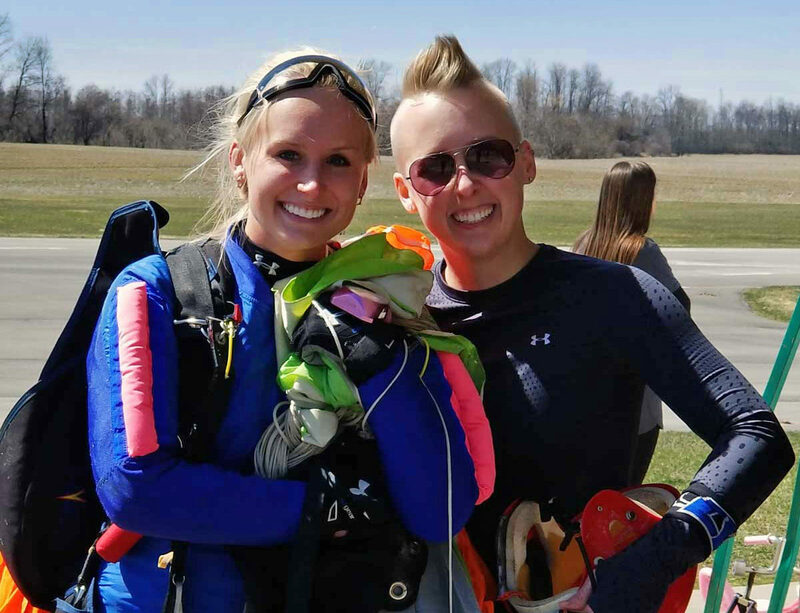 While going through the coach course at WNY Skydiving I learned more about skydiving and about myself than I had up to that point in my entire life. I learned ways to teach that made it intuitive for the learner, natural and easy to remember. I learned how to observe a person and give feedback when they are completely unaware of anything other than staying alive. And I learned a lot about my own shortcomings, and how important it is to overcome them in order to be successful in helping someone learn. I became much more confident. All of these things not only benefited me immensely in skydiving, but in life as well. I finally felt ready to be teaching skydiving. As time went on and I continued as a instruct, I started to think about what could be next. How I could keep progressing? The same way I never thought I would be in a position to teach, when I started skydiving I also insisted that I would never be a skydiving tandem instructor. I insisted I had no interest in it. Well, I got my tandem instructor rating. I am now more responsible for another person’s life and learning than I ever imagined. Shortly after getting the tandem rating, only a couple weeks later, I went on to get my AFF skydiving instructor rating. I am now able to take someone all the way from their very first skydive straight through to having their license. New opportunities are available to me. There are so many more exciting paths to choose from than anything my college degree or post-college job has ever offered. I am now much more confident in my interactions with others and my ability to navigate the different situations and problems life often presents. I couldn’t be more excited to see where my life goes with skydiving, and it’s all because I decided that I would push myself to learn a new skill and teach someone how to jump out of an airplane. Have you considered becoming a skydiving instructor? How will your life change? Check out our coach program!